Logic, emotion, youth, time and the solar-powered beer fridge. The logical vs. emotional question has been debated in smoky ad agency back rooms since back room smoking was actually allowed. 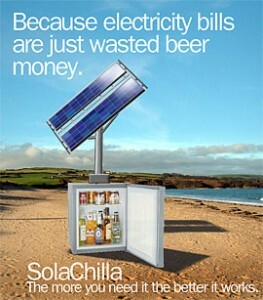 So what does this have to do with marketing a solar-powered beer fridge? Well, that’s really just a fake product ad I created to illustrate a theory I discovered in a recent online article that explored the link between age, time perception and ad creative. The article, (from MarketingProfs, one of many secret online strategic resources I use to help me sound smarter) focused on a research report done in 2005, called “Age-Related Differences in Responses to Emotional Advertisements” by Patti Williams and Aimee Drole. They tested variations of ad copy with older and younger participants to investigate how “time horizon” and the emotional versus rational appeal of an ad affect consumers’ interpretation of a marketing message. They found that when consumers see their time horizon as expansive, (I am indestructible, I will live forever! More beer!!) they remember and feel more positive toward advertising that is rational. But when they see time as limited, (A new Porsche for my 40th?! Gee, thanks, ME!!) they are more favorably disposed to and remember advertising that appeals to their emotions. Further, consumers who see time as expansive prefer ads that focus on achieving positive outcomes, while those who see time as limited are partial to ads that focus on avoiding negative outcomes. So what might this mean for messages related to, say, climate change? When communicating to a younger audience, a rational appeal focused on a positive outcome should work. Appeal to their sense of planning. Show how steps taken now can logically affect the future. Perhaps the creative use of statistics, appealing to the need to save money, and other stodgy tricks usually reserved for the balding boomer set would be more useful than we might imagine with kids these days. With the older demographic, an emotional appeal focused on avoiding a negative outcome should be the winner. Live in the now, don’t put off today what you may not be around to do tomorrow. 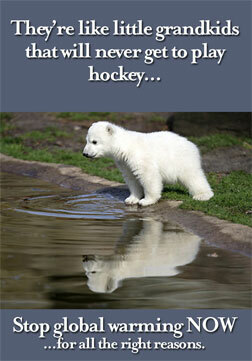 Oh, and of course, you can never go wrong with cute animals and kids here. In short, the wacky, devil-may-care advertising we usually aim at the younger set, and the late-night fact-filled Ed McMahon infomercials we force upon sleepless seniors may be the wrong messages for the wrong people. Check out the PDF of the study if you want to get more information with less glib creative commentary. Previous: « Inhance Mutual Funds takes their show to YouTube, with a lesson for all.